WASHINGTON (June 12, 2008) -- The very first of many Future Combat System vehicles was unveiled June 11 on Capitol Hill for viewing by lawmakers, members of the press and taxpayers alike. 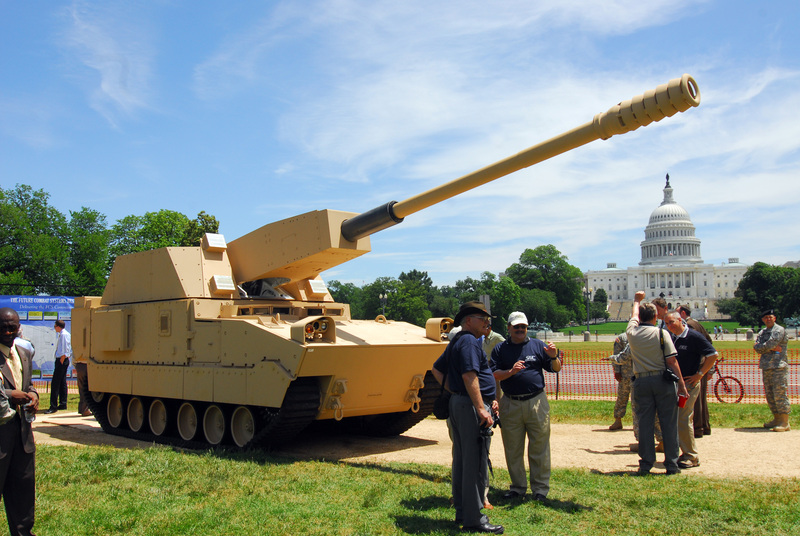 Prototype 1 of the Non-Line of Sight Cannon, one of the eight manned ground vehicles within Future Combat Systems, was displayed on the National Mall in front of the U.S. Capitol Building. Prototype 1 of the Non-Line-of-Sight Cannon was unveiled Wednesday on Capitol Hill, in Washington, D.C. A total of eight such prototypes will eventually be delivered to Yuma Proving Grounds, Ariz., by 2010. There, Army scientists will put the prototypes through rigorous testing to ensure they meet performance requirements. U.S. Senator Jim Inhofe from Oklahoma, Secretary of the Army Pete Geren, and Chief of Staff of the Army Gen. George W. Casey Jr., viewed the system. Casey said the unveiling is a milestone in Future Combat Systems development. "We have been talking and briefing and telling people about the FCS, and right here today it is real. After a decade of hard work and planning and effort, it is real," he said. The NLOS-C is one of the eight manned ground vehicles in Future Combat Systems. A total of eight such prototypes will eventually be delivered to Yuma Proving Ground, Ariz., by 2010. The first five of those will be delivered by December 2008, the remaining three in early 2009. Chief of Staff of the Army Gen. George W. Casey Jr. said the arrival of the vehicle was a significant milestone in the FCS timeline. "We've been talking and briefing and telling people about the FCS for a long time," the general said. "Right here today, it is real. After a decade of hard work, planning and effort, the FCS is real." The FCS is also relevant to Army operations today, the general said. The NLOS-C is manned by only two Soldiers, half the number required for the M109A6 Paladin, the system it replaces. And the cannon is capable of precision targeting, at a greater range than the Paladin, and from a more protected position. "That gives it relevance in both irregular and regular warfare," he said. The drive system for the NLOS-C is hybrid-electric and contains a Diesel engine that powers a generator, which charges batteries that in turn power the electric motors that drive the rubber tracks. The vehicle essentially runs on JP-8, but there is no drive shaft off the Diesel engine. The entire vehicle is electrically powered off the generator and batteries. "The first time I saw one of these in California, I was looking for the drive shaft -- but instead it was a black cable," Casey said. The electricity generated on the NLOS-C powers not just the drive motors but also the array of electrical systems on board, including radio transmitters and computers for the FCS network, motors that drive the gun, and the systems that provide automatic loading for munitions on board the system -- ensuring that Soldiers no longer need to handle the heavy shells and charges used by the system's howitzer weapon, said Lt. Col. Steve Fusinetti, the capabilities manger for FCS with the Army Training and Doctrine Command. "This thing is completely automated, and the automation system does not get tired," he said. "This is a two-man crew that never has to do the manual labor of touching the rounds like they do in a current force Paladin. Every single step is automated and the men sit in the crew compartment in the front and everything is done for them." One of the most important capabilities of the NLOS-C is its ability to act as both a node within the FCS network and a relay station as well. The network will allow commanders, detached from the NLOS-C, to know where the cannon is, how much fuel is on board, what its capabilities are, and how many rounds are still on board. Brigade commanders can view that information and the information of all other FCS systems in range and be able to make decisions on how to use them, said Col. Bryan McVeigh, project manager for manned systems integration FCS brigade combat team. "The computer system can look through and see four mounted combat systems on the ground and three NLOS-C in range," he said. "It knows how much ammunition is on each vehicle, what its range is and where the enemy is. It can then figure out, of all the assets in the brigade -- NLOS-LS, mounted combat vehicle, the NLOS-C, for instance -- which one it wants to pick to engage a target." The projectiles for the NLOS-C each weigh 100 pounds, and the system has a firing range of about 30 kilometers. Maj. Vince Tolbert, a program manager with the Future Combat Systems Brigade Combat Team, says changes made to the projectiles and charges that are at the very heart of the NLOS-C make it safer and easier for Soldiers to operate while making it more lethal for those on the wrong end of the cannon. "The NLOS-C uses a Modular Artillery Charge System, a new propellant the Army came out with after doing away with bagged propellant," he said. "It's ignited using a laser, which ignites the propellant, which is more reliable than the primer that we used to use for the artillery." The MACS is a completely sealed plastic canister that sits behind the 100-pound projectile the NLOS-C fires. The charge has a hole on each side that is sealed over with a plastic film. Instead of a firing pin igniting the charge, a laser now does the job. "You can put the propellant in either way, and you don't have to worry about the propellant getting wet anymore," Tolbert said. The NLOS-C is expected to be fielded to combat units by 2017.